Article first published as Osso Buco on Blogcritics. If you're not familiar with veal, it's a lean and tender meat from young calves. The only one place I go to for my veal is Strauss. They're located just north of the Illinois/Wisconsin border and is a reputable source for free raised veal. The veal calves are raised in the pasture, where they have unlimited access to mother’s milk and pasture grasses. Strauss also does not administered hormones or antibiotics. The veal itself is a rich pink color and is typically lower in fat. For this dish, I used veal shanks, which breaks down and becomes extremely tender after slow cooking. The veal shanks are browned and combined with a classic mireapoix (diced onion, carrot and celery mixture) and braised with white wine and chicken stock. The use of a bouquet garni (fresh springs of rosemary, thyme, bay leaves and cloves) adds a wonderful depth of flavor. To serve, I paired this with steamed rice and garnished with fresh lemon zest and parsley. Remove and discard bouquet garni from the pot. Pour all the juices and sauce from the pot over the shanks. Garnish with chopped parsley and lemon zest. 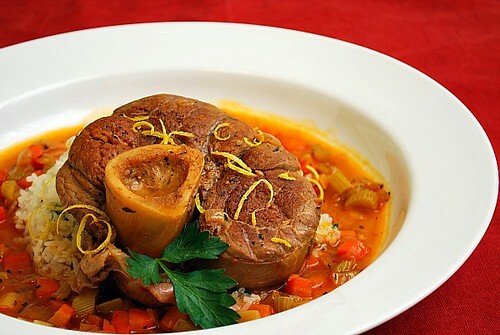 Osso buco is a nice classic to have in one's repertoire. Do you create your own recipes or focus mainly on preparing those from other sources? Thanks for your comment Alaska F&W. I tend to use recipes from other sources as inspiration where I adapt them to my tastes/preferences. Some would say adaptations are considered "original" but regardless, I think it's important to also credit where the recipes are inspired from. If anything, a majority of my "original" recipes are Asian dishes I make for my family. Asian cuisine (specifically Filipino)is my specialty and I don't necessarily highlight it on my blog.